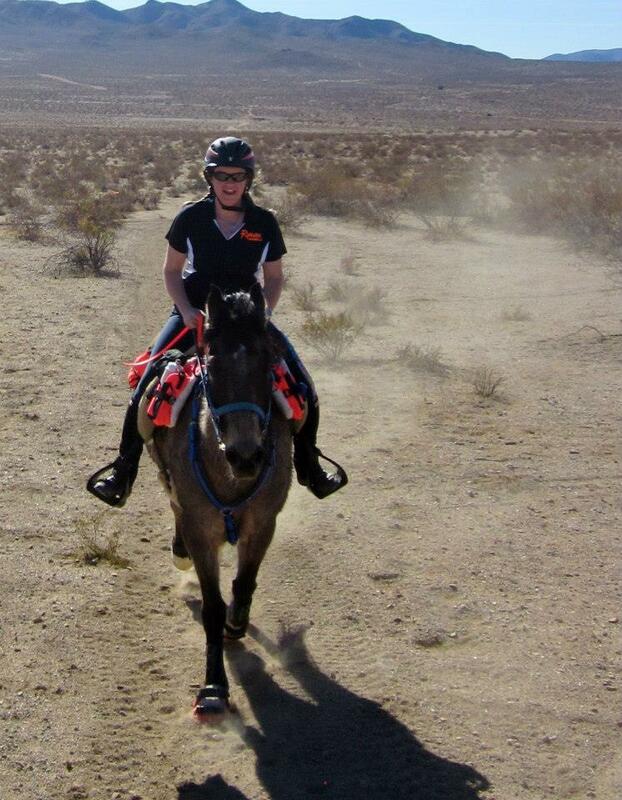 The thing is, a lot of endurance riders have multiple horses, and someone always needs to be ridden. So thanks to some generous offers from several friends, I’ve already done my first ride of the season, and I’ve got rides scheduled to at least get me through the first third of the year. First there was Kody at Fire Mountain. What was fun about Kody was that I first met him when he was a fuzzy little guy, less than two years old, and got to track his progress growing up, so to ride him as a mature, experienced endurance horse was quite fun. Two weeks ago, I met Junior and we did a “let’s get to know each other” test ride. I’ll be riding him the first day of the Old Pueblo ride in Sonoita in two weeks. No photos of Junior…yet…because it was off-and-on spitting rain the day we rode, I didn’t bring my camera, and I was riding two hands most of the way. Hopefully there will be ride pics after Sonoita. Today, I met and rode Rocco. That’s me and Rocco on the right. This pic — with the tongue sticking out — sums Rocco up perfectly. He’s a little silly, and a whole lot of fun. We’ll be doing a day at Sonoita…his first competition. True, this wasn’t quite what I had in mind for my “perfect” ride plan…but as I’m very quickly learning, what you want doesn’t always happen in the way you expect. And if you sit around waiting for everything in life to be perfect, you’re going to be waiting a very long time. Better to seize an opportunity that’s presented, even if it wasn’t according to your plan, because you can never really be sure about what it is you might be passing up. Just because something doesn’t happen the way it’s “supposed” to — at least by your definition — doesn’t mean that wasn’t the way it was supposed to happen. Right now, I’m enjoying the opportunity to get to know a variety of different horses, and find out what I really like in a horse. And riding multiple horses is never a bad thing for improving one’s riding skills. I've been riding a lot of other endurance rider's extra pasture ornaments for most of the winter and learning a lot about what I like… and hate… in other horses. I've learned that I don't care how lovely the horse can move forward if it doesn't have brakes, that 15.3 is hard to mount from the ground on trail but feels lovely underneath me, and that not enough can be said in praise of a horse who thinks about where they put their feet before they put them there. Riding all the other horses though is a fun challenge! It is pretty nice, which helps make up for July and August. Agree with all of those things! I'm learning that the larger ones, while harder to *get* on, and much easier to *stay* on than lil' go-kart ponies. And I'm actually pretty cautious about the offers I accept, since I too don't want to deal with “those” horses. In all of these cases, I've known the horses and know they were all sensible and sane. Even tho it was not exactly your plan, I think this is a pretty awesome detour! 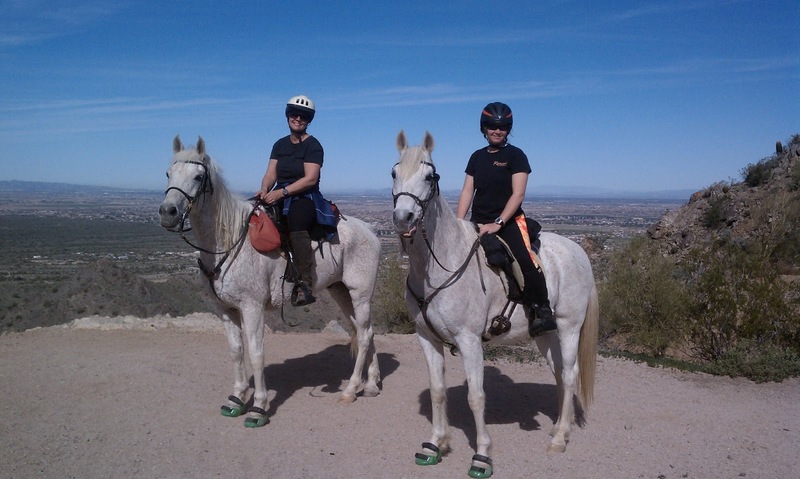 How cool that you are getting to experience other horses doing something so fun. Rocco looks like fun, and the green boots look great on him!